Home » What's Happening Locally » Gracehill Bed and Breakfast located in a Firewise TN community! Gracehill Bed and Breakfast located in a Firewise TN community! Posted by Miz Kathleen, The Innkeeper on Mar 24, 2018 in What's Happening Locally | Comments Off on Gracehill Bed and Breakfast located in a Firewise TN community! A long but fruitful journey… Today Little Round Top Subdivision in Townsend, TN, home to Gracehill Bed and Breakfast, and the community of Laurel Valley were designated the 19th and 20th certified Firewise communities in the State of TN since 2002 by the National Fire Protection Agency. 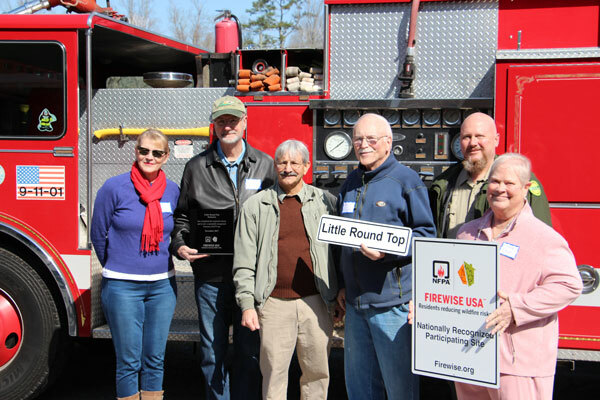 Committee Members from left Gayle Bustin, Bruce Carrington- Chairman, Leon Konz- Firewise Coordinator, Ed DeWhitt, Nathan Waters- Dept of Forestry, and Kathleen Janke. From the left, Don Stallions- Chief of the Townsend Volunteer Fire Department, Lance Coleman- Director of Blount County Emergency Management, Gayle Bustin, Darren Baily- Dept of Forestry, Bruce Carrington, Ed DeWhitt, Kathleen Janke, and Ed Mitchell- Blount County Mayor. The up-shot was I came home and made some changes including cleaning out underbrush and removing scraggly pine trees with proximity to the B&B. The nice aspect of that was it opened it up to a more park like setting, instead of an impenetrable wall of green in the summer. A few months later, Leon contacted me and I held a Firewise meeting here with some neighbors. A few of us went through a Firewise assessment of our homes. But even with the prospect of grant money hanging in the balance, we fell well short of the official designation. It was a lot of work! I mean hundreds of hours. Then we woke to the reality of the Gatlinburg fires in 2016, and all of a sudden things took on a new perspective. With great neighbors, the work didn’t seem so bad after all, but I have to admit I was most happy just hosting meetings and baking cookies. Made a few phone calls along with Gayle Bustin, but Edward DeWhitt and our chairman, Bruce Carrington, accepted the brunt of the work and had the tenacity to get it done. The recognition ceremony was today, and I have to admit I felt we accomplished something good. We have lots of ideas for the grant money and for the future, but first on the list, are three items for 2018. We bought a portable pump that can be thrown into our three acre pond that will pump water out into a huge collapsible pool. 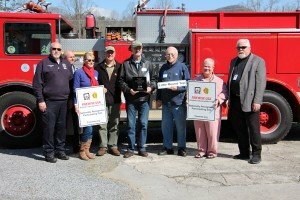 The Townsend Volunteer Fire Department will carry those items on their truck, and it will save a 30 minute round trip back to town to refill the tankers. Over the next three years, Bruce will also become a shepherd for forty days each summer and fall. We have a five acre patch of kudzu that will be enclosed with an electric fence and powered with solar panels, new home to fifty goats and one guard dog. Bye-bye kudzu, which is extremely flammable.